Bicycle tours are a great way to reconnect with friends and family, or just enjoy your surroundings solo. 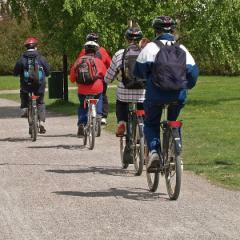 Many vacation destinations feature guided bicycle tours, or you can plan one yourself. Browse this bicycle rental service directory for information about bicycle rental services in the United States of America. All directory listings include contact information, category tags, and website links. View this website to learn tips about buying a bicycle, whether it be a road bike, off-road, or a cruiser. Information about each type of bicycle is included. This cycling guide features a brief history on cycling as well as links to bicycle parts, accessories, racks, tours, and more. This motorized bicycle directory comprises information about motorized bicycle suppliers throughout the United States. The motorized bicycle image on this page depicts a motorized bicycle in a field. Each directory listing includes contact information and a website link. This bicycle directory comprises information about bicycle manufacturers throughout the United States. The bicycle image on this page depicts a bicycle doodle drawing. Each directory listing includes contact information and a website link. This bicycle rental directory page comprises information about bicycle rental services in Phoenix, Arizona. Each Phoenix bicycle rental listing includes a website link and a phone number. This bicycle rental directory page comprises information about bicycle rental services in San Diego, California. Each San Diego bicycle rental listing includes a website link and a phone number. This bicycle rental directory page comprises information about bicycle rental services in Denver, Colorado. Each Denver bicycle rental listing includes a website link and a phone number. This bicycle rental directory page comprises information about bicycle rental services in Chicago, Illinois. Each Chicago bicycle rental listing includes a website link and a phone number. This bicycle rental directory page comprises information about bicycle rental services in New York, New York. Each New York bicycle rental listing includes a website link and a phone number.